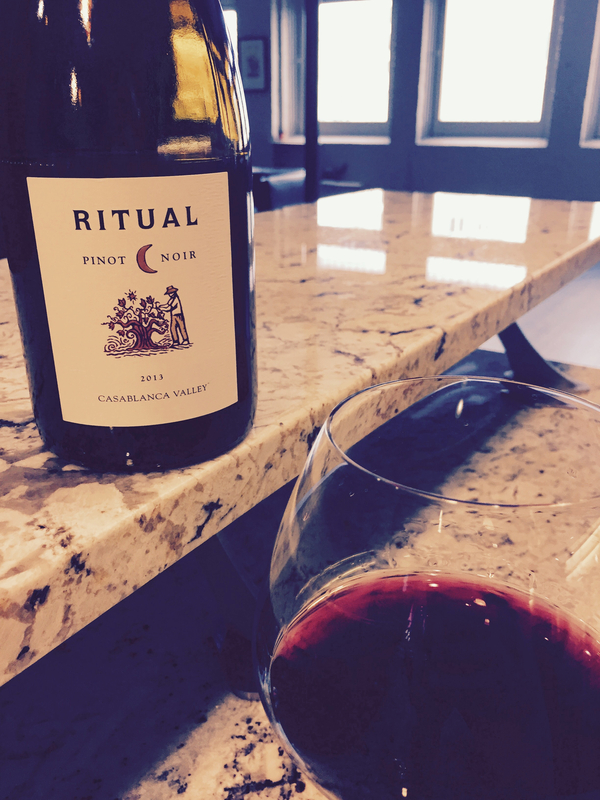 Estate: Ritual is the result of the partnership of the Huneeus family of the Veramonte estate in Chile and American winemaker Paul Hobbs with a goal of producing a “premium, yet affordable, Pinot Noir from the Casablanca Valley”. The Veramonte estate is located between the Andes Mountains and the Pacific Coast, just northwest of Santiago in the Casablanca Valley. The estate is dedicated to crafting “terroir expressive wines”, and is therefore committed to committed to caring for the land and environment. The estate is home to one of the most extensive contiguous vineyards in Chile, with over 420 hectares of vines. More then 4500 hectares of native forests are preserved as a natural green belt and are home to many indigenous animals and birds that surround the vineyards. Winemaking: Sustainable and organic methods are used, with 120 acres in the process of becoming certified organic. Grapes were sourced from 3 different vineyards within the estate. Wild yeast fermentation then aged up to 14 months in French oak barrels [40% new]. Tasting Notes: Red-violet in colour with aromas of earthy warm brick, sweet oak, and black pepper. Jammy cherry and blueberry flavours around an earth and oak based core, peppery spice and toasted oak saturate the finish. With the emphasis the estate places on their wines reflecting the unique terroir of Chile and conveying a “sense of place”, [including their sustainable viticulture practices and use of wild yeasts] this Pinot Noir was rather disappointing. Yes it was a pleasant bottle, but I found it to taste like an average California, over-oaked wine. Clearly, Paul Hobbs winemaking influence can be seen, which makes this a good example of the interesting study of winemaking technique vs. terroir. In fact, many of the reviews I found compared this to California wines; one review even clearly marked it as tasting like a Pinot Noir from the Russian River Valley or “perhaps even Santa María Valley”. Multiple critics state that this tastes like an American Pinot Noir [and view this as a positive quality], whereas, I see it as a compromise and/or failure of their mission statement to craft wines that express the unique terroir of the Casablanca Valley. Produced and Estate Bottled by Alto de Casablanca S.A.
As I’ve said a few times, too much Chilean Pinot Noir is made as though it’s Cabernet Sauvignon – too much extraction, time in barriques etc. If it’s made in that way it might sell well but doesn’t stand a good chance of expressing terroir. i absolutely agree. hopefully it is a trend that will pass.